Like most birds I eat anything and that includes the furniture when the family is not looking. I always make a fuss when I see someone else eating and annoy them into letting me have a bit of their food by rattling my water bowl. Meyer, a lonely widower, was walking home along Delancy Street one day wishing something wonderful would happen into his life when he passed a Pet Store and heard a squawking voice shouting out in Yiddish: "Quawwwwk...vus macht du...yeah, du...outside, standing like a putzel...eh?" Meyer rubbed his eyes and ears. Couldn't believe it. The proprietor sprang out of the door and grabbed Meyer by the sleeve. "Come in here, fella, and check out this parrot..." Meyer stood in front of an African Grey that cocked his little head and said: "Vus? Kenst reddin Yiddish?" Meyer turned excitedly to the store owner. "He speaks Yiddish?" In a matter of moments, Meyer had placed five hundred dollars down on the counter and carried the parrot in his cage away with him. All night he talked with the parrot. In Yiddish. He told the parrot about his father's adventures coming to America. About how beautiful his mother was when she was a young bride. About his family. About his years of working in the garment center. About Florida. The parrot listened and commented. They shared some walnuts. 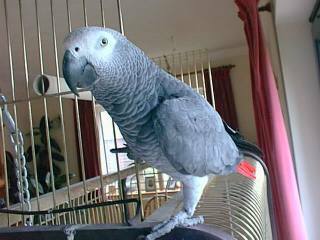 The parrot told him of living in the pet store, how he hated the weekends. Then they both went to sleep. The next morning, Meyer began to put on his tfillin, all the while, saying his prayers. The parrot demanded to know what he was doing and when Meyer explained, the parrot wanted some too. Meyer went out and hand-made a miniature set of tfillin for the parrot. The parrot wanted to learn to daven and learned every prayer. He wanted to learn to read Hebrew so Meyer spent weeks and months, sitting and teaching the parrot, teaching him the Torah. In time, Meyer came to love and count on the parrot as a friend. The parrot had been saved. One morning, on Rosh Hashona, Meyer rose and got dressed and was about to leave when the parrot demanded to go with him. Meyer explained that Shul was not place for a bird but the parrot made a terrific argument and was carried to Shul on Meyer's shoulder. Needless to say, they made quite a spectacle, and Meyer was questioned by everyone, including the Rabbi and Cantor. They refused to allow a bird into the building on the High Holy Days but Meyer convinced them to let him in this one time, swearing that parrot could daven and really should be allowed to be part of things. Wagers were made with Meyer. 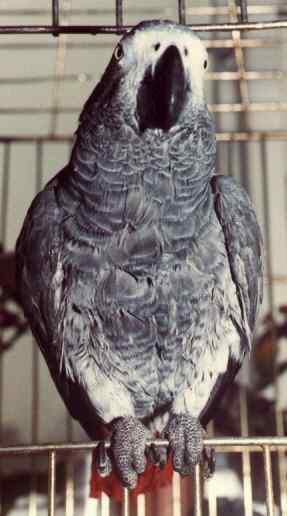 Thousands of dollars were bet (even odds) that the parrot could NOT daven, could not speak Yiddish or Hebrew, etc. All eyes were on the African Grey during services. The parrot perched on Meyer's shoulder as one prayer and song passed - Meyer heard not a peep from the bird. He began to become annoyed, slapping at his shoulder and mumbling under his breath, "Daven!" Nothing. "Daven...parrot, you can daven, so daven...come on, everybody's looking. Daven!" Nothing. After Rosh Hashanah services were concluded, Meyer found that he owed his Shul buddies and the Rabbi over four thousand dollars. He marched home, very angry and saying nothing. Finally, several blocks from the temple, the bird began to sing an old Yiddish song and was happy as a lark. Meyer stopped and looked at him. "You miserable bird, you cost me over four thousand dollars. Why? After I made your tfillin and taught you the morning prayers, and taught you to read Hebrew and the Torah. And after you begged me to bring you to Shul on Rosh Hashona, why? Why did you do this to me?" "Don't be a schmuck," the parrot replied. "Think of the odds on Yom Kippur!" In January 2000 Linda (Pauls wife) complained that me and my cage smelt bad. So on a fairly warm and still day Paul took me in my cage outside to be hosed down with water. It is really the only way to do the job properly. As it was still winter Paul wanted to reasure me that this treatment was not a punishment so he kept saying "he's a good boy!" over and over. Then he took me inside in front of the radiator to dry out and kept whistling at me from upstairs. I of course whistled back and kept repeating "he's a good boy" just for fun. I am a good talker and am ace at whistling tunes. If you like the sound of my whistle - you should hear some of the other stuff I can do. Paul says he will try and get all my words on a file but he needs to work out how to compress .wav files - If you can help please email him. Click on petbird icon below to hear more. Click a Pic for more pages! This guy goes to a pet shop to buy a parrot. There he sees a parrot with a red string tied to its left leg and a green string tied to it's right leg. He asks the owner the significance of the strings. "Well, this is a highly trained parrot. If you pull the red string he speaks French; if you pull the green string he speaks German," replies the shop keeper. "And what happens if I pull both the strings?" our curious shopper inquires. 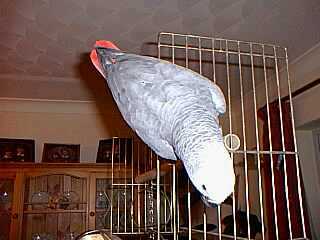 "I fall off my perch you fool!!" screeches the parrot. On reaching his plane seat, a man is surprised to see a parrot strapped in next to him. He asks the stewardess for a coffee where upon the parrot squawks, "And get me a whisky you cow." The stewardess, flustered, brings back a whisky for the parrot and forgets the coffee. 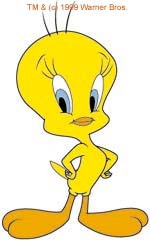 When this omission is pointed out to her, the parrot drains its glass and bawls, "And get me another whisky you ****." Quite upset, the girl comes back shaking with another whisky but still no coffee. Unaccustomed to such slackness, the man tries the parrot's approach, "I've asked you twice for a coffee, go and get it now or I'll give you a slap." Next moment, both he and the parrot have been wrenched up and thrown out of the emergency exit by two burly stewards. Plunging downwards the parrot turns to him and says, "For someone who can't fly, you sure are lippy!." Do you want to join The Grey Parrots Ring?